# DIXSTBC256 -Style STBC T-Bolt - Hose OD: 2.326 in. to 2.622 in. 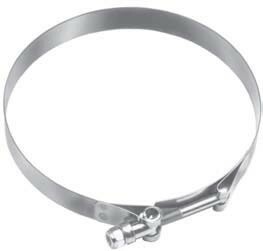 # DIXSTBC256 - Hose OD: 2.326 in. to 2.622 in. - Style STBC T-bolts can be applied with a standard 7/16" socket wrench. 3/4" wide 300 series stainless steel band, .025" thick. 300 series stainless steel bolt, torque rating 50 in/lbs. Hose Range 2.326 in. to 2.622 in.